Angelle Sampey, 44, rejoined Star Racing last fall and is eager for the NHRA Pro Stock Motorcycle season opener this weekend. GAINESVILLE, Fla. -- The marriage proposal came as she'd hoped, and her conditional answer was delivered as she planned. "I said 'I'll marry you,' " Angelle (pronounced on-JELL) Sampey recalls of the 2010 conversation with Seth Drago, then her boyfriend of a few years. " 'But I want to get pregnant right away.' "
The winningest female driver in a major professional motorsports class was nearing 40 and wanted to start a family. 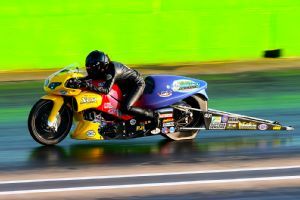 That wouldn't be the only reason she would step away from NHRA drag racing with years left to build on her 41 victories and three championships in Pro Stock Motorcycle, but it would be the deciding factor after sponsorship didn't materialize for 2009. Angelle Sampey feels blessed to have both a career and a child (4-year-old daughter Ava Jane Drago). Sampey would focus on being a wife and mom and running Coral Fever, the saltwater aquarium business she and Drago have in Mathews, Louisiana. And when Ava Jane Drago came along in 2011, it seemed certain the former Cajun tomboy beauty queen with an attitude would leave the late Dave Schultz's Pro Stock Motorcycle record of 45 national victories for others to chase. But something deep inside Sampey still burned. When George Bryce, the architect of her championships and most of her wins, called late last summer to say he had an unexpected opening at Star Racing and needed her back, Sampey's resistance melted like wax. Bryce had called before, but this was the first time he had a solid offer. "Oh, my goodness,' let me call my husband and talk to him and I'll call you back," Sampey told her mentor. She called him back five minutes later. "OK, he said I can do it, and my mom said I can do it, and I'm interested," she said. Her comeback last fall lasted all of three uneventful races before a freak accident at The Strip at Las Vegas -- a heavy cart rolled onto her ankle -- left her with a lacerated Achilles tendon. But after surgery and five months of rehab, Sampey, 44, with Ava Jane and parents David and Gail in tow, is back for her division's season opener at the Gatornationals in Gainesville, Florida, this weekend. In Friday afternoon's first-round qualifying, she was No. 1 with an elapsed time of 6.892 seconds (192.93 mph). She finds herself grateful both for another go-round with Bryce's Georgia-based team in its 35th anniversary season and for "the unanswered prayers" that kept her on the sideline while she was trying to find sponsorship for a Funny Car ride with veteran Antron Brown and, later, a Top Fuel dragster with driving legend Shirley Muldowney. 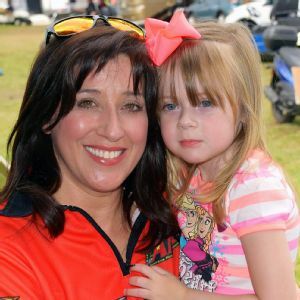 "If I would have gotten that deal with the Top Fuel car, I don't think I would have ever had a child," Sampey said, pausing as if she's taking in the realization anew. "That would have been the biggest mistake of my life. Ava is the best thing that has ever happened to me. I would trade all 13 years, all three championships and all 41 wins to have her instead of what I've done. But, fortunately, I've been blessed having both, the career and the child." The significance of Sampey's return to a division she once owned leaps out through a current poll on the website of National Dragster, the NHRA's official publication. George Bryce, a mentor and architect of Angelle Sampey's championships, had called before but had a solid offer for her last summer. Fans were asked to name their favorite current Pro Stock Motorcycle driver, and as of Friday morning, 0.7 percent had voted for Andrew Hines, the well-spoken four-time and defending champion, who, with 38 wins, is also chasing Schultz's record. The No. 2 vote-getter was Steve Johnson coming in with 5.4 percent. Sampey -- all 5-foot-1 and 112 pounds of her, and away for quite some time -- was the runaway leader with 73.3 percent. "My mechanic, Ken Johnson, looked at that and said, 'Dang, you haven't even won a round in, like, 10 years," Sampey said. "It definitely feels good to have the love and the support from the fans, because that was one thing I was worried about -- what kind of reception would I get coming back -- wondering whether people would look at me as a 'has-been,' 'don't care,' or 'go back home.' But it has been awesome." Part of the appeal is how she got here. Fans who have been around for a while know the story of how a teenage Sampey was thrust into beauty pageants after dad came home one day and found her caked in mud after an afternoon of unauthorized four-wheeling. Mom would make a girl out of her or else, and Sampey went kicking and screaming until she figured out pageants were just another form of competition. "I said, yeah, I can do this," she said." Her brother Rickie was supposed to have been the motorcycle racer. Dad sent him to motocross school in California and he was good, but he never had Angelle's obsessive nature. "He was happy racing and having fun, but if he didn't win, it wasn't that big a deal," Sampey recalled. "For me, if I didn't win, I couldn't breathe." There's the story of how Sampey was left to care for then-fiancé Kevin Seeling's street bike in 1991 when the young Marine was shipped off to the Persian Gulf. She was supposed to run the engine once in a while and wipe the fingerprints off the gas tank. Seeling had never specifically said she couldn't take the bike to the local drag strip to see what it could do. Sampey did, and she was hooked. She and a friend of the couple stripped the bike of all its street-legal parts, put a wheelie bar on the back, and a racer was born. Seeling returned to find his once-pristine Kawasaki Ninja turned into a drag bike. "He got a little aggravated at first, but then he came with me to the track, and he fell in love with it," Sampey said. She was three days shy of graduating from nursing school a few years later when a storm parked over New Orleans for 13 hours and flooded her house, ruining every possession she had except her drag bike. Going for broke, she sold the bike to raise money to attend Frank Hawley Drag Racing School in Florida. A backup plan? There wasn't one. With 41 career national victories, Angelle Sampey is just four shy of tying the NHRA Pro Stock Motorcycle record. That's where she met Bryce, an instructor at the school who had won championships with Star Racing. She made him focus on her talent, showing up with a Batman hat pulled down over her face and in an unflattering T-shirt. Only later did she show him she could use hair, makeup and charm to create the image that would help attract sponsorship dollars. 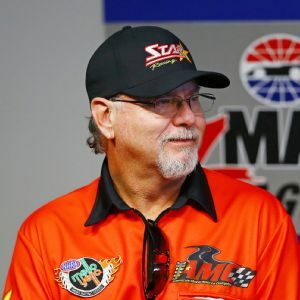 "I knew if I was going to jump in with both feet on a little bitty girl riding a motorcycle, which hadn't been done in Pro Stock Motorcycle, it was going to be something special," Bryce now says. The owner recalled a conversation that he and his wife, Jackie, had with Sampey before her NHRA debut in 1996, more than a year before they landed the lucrative Winston sponsorship that would launch them on a tear. "She said she first wanted to win a round, then a race, and in about five years, a championship," Bryce said. "And she wanted to have a Suzuki dealership, a red six-speed Corvette and a pet monkey. Within 24 months, she had all of them." Hines, the current champion, was a crew member on his brother's team when Sampey was at her peak. He said it was "pretty spectacular" to watch her and "it's going to be bring some notoriety to have 'the girl,' as she was always called, back in our sport." "We had a good rivalry racing early in my career when she was on the Army bike at Don Schumacher Racing," he said. "Brings back my drive to want to go out there and win even more. Sampey's eventual marriage to Seeling was short-lived, and another to former New Orleans Saints tight end Nicky Savoie dissolved in the early 2000s. She has raced under her maiden name and the names from her first two marriages, and she sometimes goes by Sampey-Drago. She's happy now with "a great husband and beautiful daughter," and determined to find the sponsorship she and Bryce will need to continue beyond the first three races. (She has Bates Leathers, Full Blown Paint and Impact Racing at Gainesville.) She returns to a division that's much tougher than she left it, and she knows that for all of her fans, she also has detractors. "I'm sure there are still the haters out there that are puking their guts up, but oh well," she says with that old air of Sampey confidence. "They can mute the TV or change the channel while I'm up. I don't give a damn. I'm back."